So I used to play WoW like crazy and had spent countless days and nights on that game. Recently I found myself in love with LoL. As the addiction went more severe, I wondered what would it like if I put WoW and LoL together to have a third-person view RTS/TD game. So I have decided to use the art elements in WoW to implement a prototype in Unity. I have finally figured out a rough pipeline of export a animation from wow model viewer and eventually import into Unity and play. The trick is to have Autodesk 3ds Max sat in between. The remaining issue is how to export multiple animations at once(as of now only one animation at a time). Also, I would love to have some armors/weapons also imported- they shouldn't fight with bare hands. 1. Added Unity water and a default skybox. 2. Rebaked mesh to avoid minions walking under water. 3. A line drawn from top of tower to its current target. 1. More time has put into animation export/import but nothing works yet. Milkshape3D is introduced to help the process. 2. Need to have health bars and figure out a way to have the minions die. After more than a week of exploration, here are the things I have accomplished. 1. 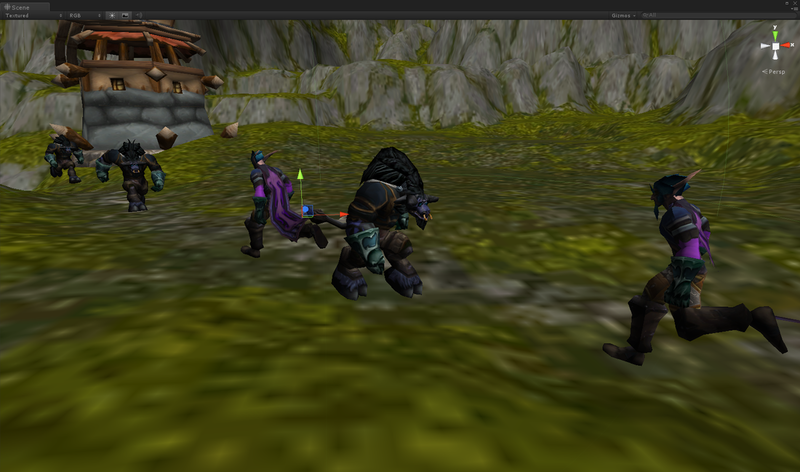 Figured out how to extract terrain mesh and building models from a installed WoW client package. Tools include Machinima Studio Pro, Wow model viewer. 2. Imported Arathi Basin terrain into Unity, along with a few Orc towers and Human towers. They are placed in a similar way as LoL/Dota. 3. Baked navigation mesh based on terrain and towers. Created a simple minion behavior state machine and set a few path nodes to make them spawn/move to different routes. 1. Animation couldn't properly imported. Disclaimer: Blizzard owns all the environment/character/animation and whatever other art elements appear in the game. Riot owns part of the game design I guess. I wrote code to prove a game concept I thought would be fun for research purpose only. Please don't sue me.